Agree. Been trying to set up buy orders for over 20mins now...market moving alot and i cant get in. Frustrating! Alerts as to when one can place an order would save a lot of time. This is a question that is appearing time and time again. I had asked it many times in the past. Bitcoin in USD, Bitcoin Cash in USD and Ether in USD is only closed from Friday 10:00 pm to Saturday 8:00 am. 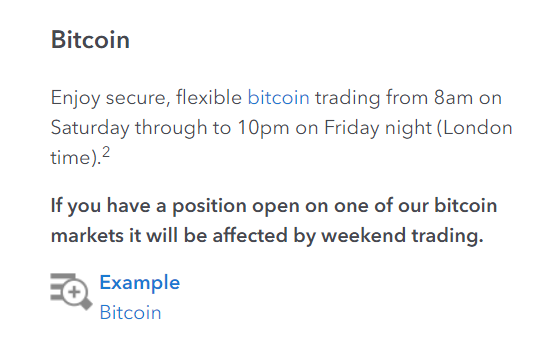 Bitcoin, GBP, Bitcoin EUR and Bitcoin Cash GBP are closed from Friday 10:00 pm to Sunday around 9:00 pm - 10:00 pm. I understand it is frustrating as it was for me. IG have explained all about 'wallet risk' , etc. and at the moment they have no intention to extend this. I think once there is more volume on Crypto trading on IG then they would have to revisit this. It is utterly bizarre. It is like asking someone to trade a FTSE 100 share on IG but not allow traders to from 1:00 pm - 4:00 pm on Friday and 8:00 am - 11:00 am on Monday. A lot can happen during Asian trading hours and UK traders on IG Index are missing out. Asia is where the majority of the Bitcoin is mined. There is a much better understanding of Crypto's within Asia and the likes of South Korea are active traders in Crypto's. Haha, Now I found another issue when I think it was brought up in the past too, I am sorry I know I should read up. I tried to buy btc when it was tradiing at 10800 this morning when it was an obvious gain and guess what, I got a "You cannot currently buy this market to open a position" error popped up. Some smart algorithm knew that a lot of people "fomoing" (fear of missing out) and the system rejected my buy order! and for goodness sake, You all are already charging 0.0416% parking fees for each day and why are u all rejecting our longs? I find its quite ridiculous. I just tried to tried to go long on Bitcoin USD at 6:45 am today and guess what I got exactly the same message. This happens far too often and to me regardless of what explanation IG give, they have the 'edge'. Just like at the Casino, the house always wins. To me it is pointless offering a product that you cannot open a position on when you want to during IG's own market opening times. This has been happening for months now. IG have explained their rationale numerous times so the decision rests with the client. IG's Cryptocurrency service did not suit my needs and therefore I used other platforms and ways of investing in Bitcoin in particular. Which other platforms would you recommend please? IG hopeless that we can't buy when most beneficial to! And it happened again half hour ago when bitcoin dipped. This does seem like a deliberate automated action whenever price dips to a very potentially profitable level. A possible solution iv found - being a savvy scot - is to have orders in the background (granted it eats up your balance with the margin). When price looks good edit to a price that will execute immediately. Voila! The Cryptocurrency market is open around the clock and on weekends, so there’s no need to wait till Monday! Trade cryptocurrencies with up to 1:30 leverage. You can start with as little as £100 to gain the effect of £3,000 capital! Why does IG platform not allow trade in Bitcoin? I may have misunderstood your question but IG does allow trade in Bitcoin via either Spread Betting or CFD's. Ermmm. Not quite. Certainly not all the time. They turn it off quite regularly when demand and volatility are high. Sadly that is precisely the scenario people want to take advantage of! Yes I accept that point Luigo. 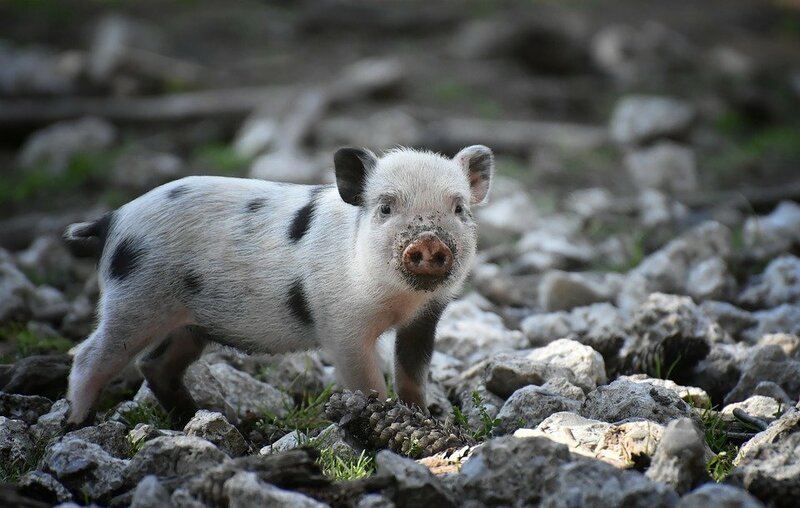 I agree with your point. 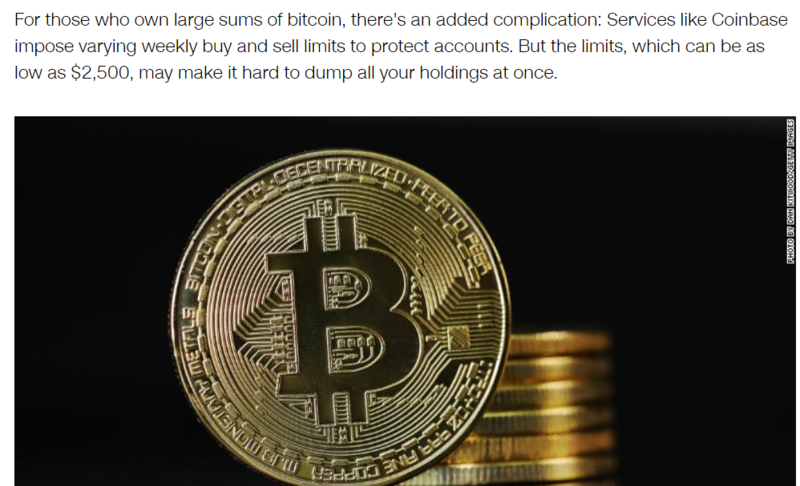 There is no point in offering GBP and EUR currency hedges in Bitcoin when IG cannot even offer pure 24 hour 7 days a week Bitcoin trading in USD. Thanks - Apologies for sounding a bit cynical but isn’t volatility exactly what crypto trading requires. Caveat Emptor - the trading platform shouldn’t decide outcomes for a paying subscriber. 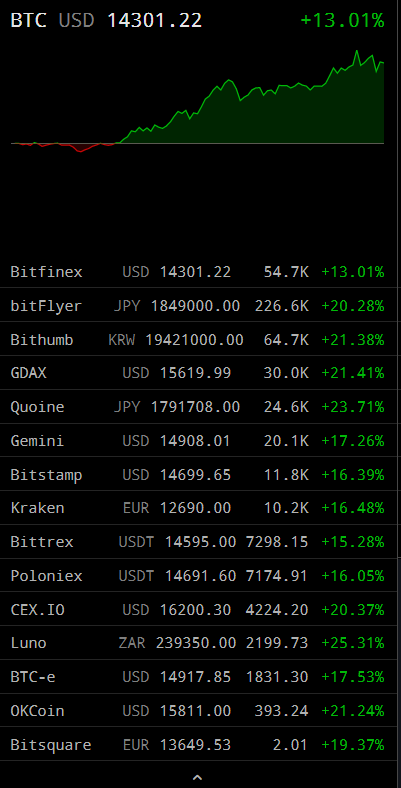 Is it just me or does the current price disparity re; btcusd on these exchanges look a bit 'wild west'? Hi - - I appreciate the frustration in not being able to trade this BTG coin, and I want to confirm that we would of course like to offer this as a tradable asset as long as it's possible to do so, and the underlying technology is safe. At the moment the exchanges which we deal with are yet to list it. Although some exchanges are trading this particular coin they are generally in China and S.Korea, or on exchanges which don't offer fiat withdrawals or trading pairs. We will keep all clients updated as best possible. 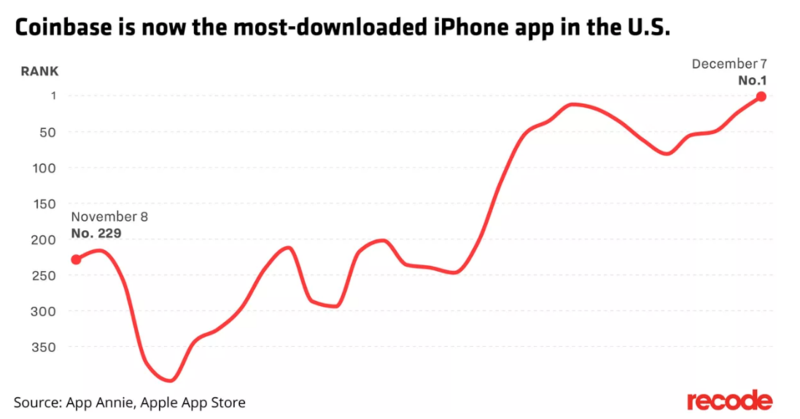 Everyone has piled in, coinbase now no1 downloaded iphone app. Why are bitcoin and ether closed? It's a 24/7 global market? Caseynotes, I am coming across a lot of people asking this same question. Thanks for posting this. I think it maybe an idea for James to look into seeing if this could be posted however small on the main website page? Just a thought. Journalist's experience buying and selling on Coinbase, delays, outages, restrictions, periods where unable to sell. New webinar from Dailyfx (recorded today) discusses most recent news that have moved the markets (including Ether). Also, the arbitrage potential on the disparity between the exchanges (I posted on the disparity in this thread on Thursday). Plus takes a look at the charts of some of the main movers in in recent days. Just out of curiosity, could you please give a few thoughts on when a CFD (any crypto in this case) could become unavailable to trade (or open buy)? I'm sure there is a good reason, just looking for some clarity. Interesting Ripple facts; Ripple Labs now world's 10th most valuable company, only 38% of coins are in circulation, CEO currently worth $55 Billion. I have been calling for IG to offer Ripple for a while now and am screaming for IG to offer Stellar as it could see 'stellar' gains in 2018 and it would be nice if we could participate before the gains are made like in Ripple. 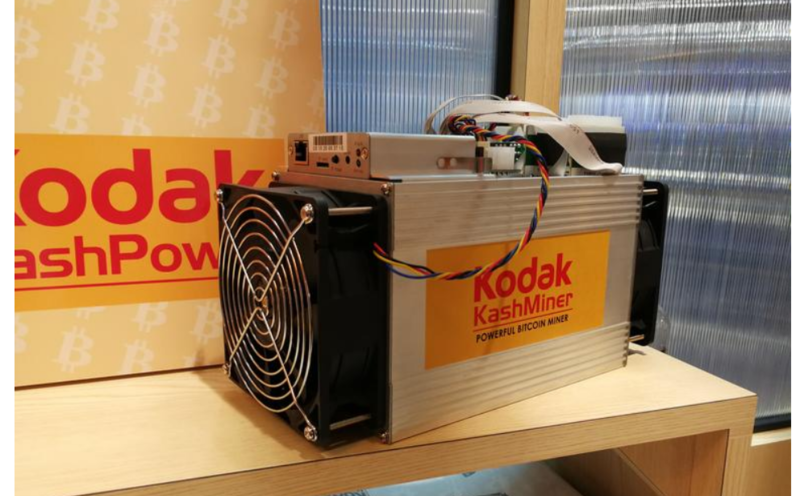 Get in on the mining scene with Kodak's new Kash miner. 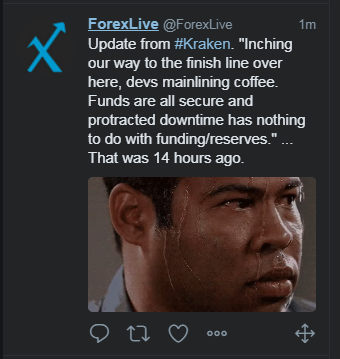 Kraken crypto exchange down for near 2 days now after a planned update appears to have gone wrong, twitter going into meltdown due to lack of info and hacking fears. Is there any tools/app/calculator to determine the margin required and profit/loss for my position at different price level?